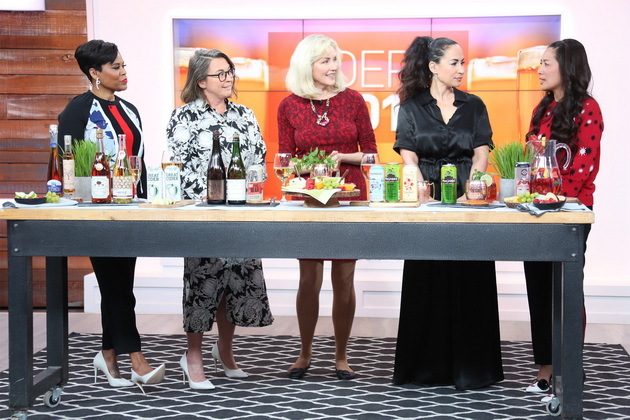 On CTV’s The Social yesterday, we had fun chatting about all things cider, from serving it (glassware, temperature) to pairing it with food; from cocktails to fascinating historical trivia. St. Patricks Day is this weekend and if you’re looking for an alternative to beer, why not have some cider instead? With so many different types, there’s sure to be a cider that will please your palate! 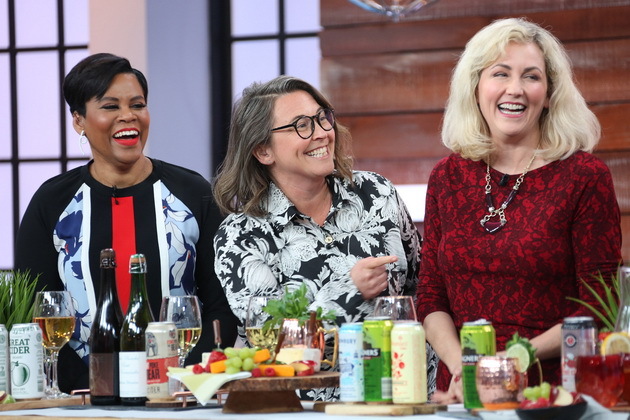 Here to break them all down for us is Natalie MacLean, who offers Canada’s most popular online wine classes. Tell us a bit about the history of cider and why it’s gaining so much popularity right now. • Most commonly made from fermented apple juice, hard cider is widely popular across the world, especially in the United Kingdom. • The first known evidence of intentionally fermented cider is from around 55 B.C., when Romans marched into Kent, England, and found the locals fermenting the juice of apples into an alcoholic beverage. • And while it dropped off in popularity over here for a time, the modern craft beer movement has inspired a similar resurgence in the world of cider. It’s also a great gluten-free alternative for beer lovers. What exactly is cider because it’s somewhat like beer but also kinda like wine? • Beer is made from malted barley and wine is made from grapes, whereas cider is made from apple juice. • While a beer can contain fruit and other ingredients, no true cider contains malted grains. That’s what makes it gluten-free. • Wine, beer and cider rely on yeast to ferment sugars to produce alcohol. How do they differ in terms of alcohol content? • Cider tends to be in the 6-8 % range, whereas beer averages 4-6% and wine is 9-15%. • The fermentation process is similar, but longest for wine, so more of the sugar is converted into alcohol. • This means that often wine has higher alcohol levels and less sweetness than cider where all of the sugar may not have been converted into alcohol. What’s the difference between how hard ciders and non-alcoholic ones are made? • Cider is anything that starts with an apple. Once harvested and washed, the apples are crushed into a uniform pulp called pomace. This is pressed to extract the juice, which is then strained through cheesecloth into jugs for non-alcoholic cider. • Hard cider goes the extra step of being fermented using yeast like wine. The juice is fermented to about seven percent alcohol in either oak barrels or stainless-steel tanks for four to six months. Hard ciders are generally either sweet or dry, is that right? • Yes, when it comes to hard cider, sweet and dry are the two main flavours. • Dry hard ciders have all of the sugar fermented and converted into alcohol, and therefore are often a bit higher in alcohol than sweet ciders where some of the sugar remains unfermented. • Sweet ciders can also have all of the sugars fermented into alcohol then have sugar added afterwards. • Here we have a Nicolas Cider from Quebec. It’s medium dry with floral and apple blossom aromas. • A Bordelet Sidre Brut from France which is a crisp, dry cider with noticeable tannins. • A Cider Bouche Brut also from France which is produced by Drouhin, famous for its Calvados (apple brandy), this is dry with a hint of caramelized apples on the finish, made from 30 varieties of apples. • Jess I’m going to have you try D’Ont Poke the Bear. It’s based in Ontario, made with 7 varieties of apples grown in Calendon, and this one has a neat story because part of the proceeds go towards anti-bullying campaign. It’s medium sweet with aromas of crisp ripe apples – the acidity makes it taste less sweet than it is. There are so many different types of cider out there and I thought I loved them all but I don’t think I’ve had an organic one before. What makes a cider organic? 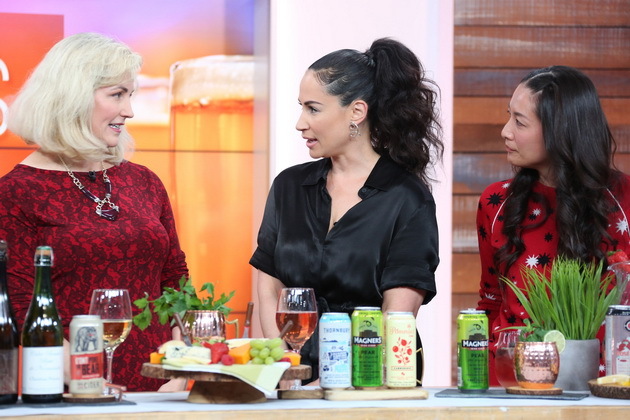 • The Great Canadian Cider Company works with local organic apple growers in Ontario to rehabilitate organic orchards which have been neglected. • This cider is Certified Organic by Pro-Cert so it doesn’t use any synthetic pesticides, fertilizers or herbicides in growing the apples, and they add no sulphites during the cidermaking process, whereas cider that is not designated organic may use these chemicals. • This organic cider also hand-picks its apples and the cider is cold fermented slowly, to develop the complexities of flavour from each type of apple. They add organic cane sugar to about 4.75 grams which makes it roughly the same level of sweetness as an off-dry wine like say Riesling. They also recycle the pomace from the apple pressing back into the orchards. Another kind is ice cider. How is it different from regular hard cider? • Hard cider is made from apple juice that has a sugar level of about 12 to 14 brix whereas ice cider juice is much sweeter at 30 to 35 brix. Brix is the technical term on how they measure sweetness in a liquid. • Therefore, the final sweetness of hard cider is like an off-dry wine, whereas ice cider is akin to icewine sweetness. There’s also sparkling cider, which I love. How is that different from the regular stuff? • There’s not too much difference really. They’re both about six percent alcohol. • Hard ciders have a bit of fizz or spritz — that tingling sensation you get on the tongue, much like beer. • Sparkling cider is often made by adding CO2 bubbles for carbonation after the cider fermentation is complete. Some sparkling ciders use the same method that is used for champagne, where a second fermentation takes place inside the bottle, trapping the bubbles. • Here we have a rose sparkling cider but I’m going to have you try the Neige bubble sparkling cider. There are so many different types of apples out there! Which ones are used to make cider? • The best eating apples, such as Red Delicious, are too sweet for cider and don’t have enough acidity to balance their sweetness. Generally, many apple varieties are blended, each for the character it contributes to the final taste, whether it is tart acidity, sweet fruit, structural tannins or spicy and floral notes. • More than forty apple varieties, with such delightful names as Red Streak, Foxwhelp, Peasgood Nonsuch, Nobbed Russet, Sheep’s Nose and Lady’s Finger of Lancaster, are used to make cider in England. There’s even one with a bit more alcohol in the finished cider called Lyne Down, a nod to how the cider should best be consumed. In Canada, the most popular varieties are Granny Smith and McIntosh. Can you use any fruits besides apples to make cider? • Yes, you can, and when a cider is made from fruit other than apples it’s called a fruit cider versus just cider for the apple-based kind. • Lainey, why don’t you give the Pommies Cranberry cider a taste. • There are so many different types you can have though. Pear, blackberry, cherry, the list goes on. • The alcohol level tends to be the same as apple-based cider. I’ve seen cider served many ways, sometimes even over ice. How should it be served? • You actually want to warm your cider up a bit before you have it. • Most are served way too cold, straight from the fridge. 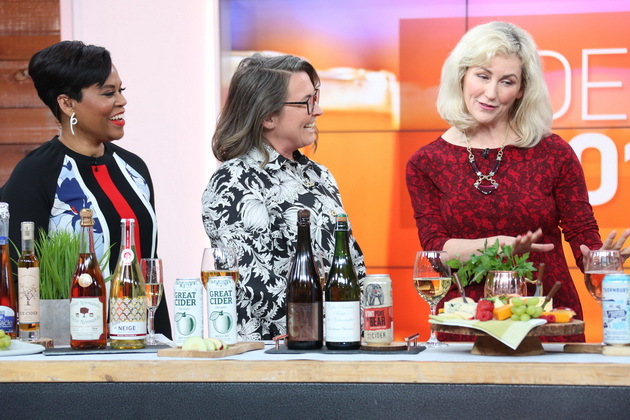 • That’s ok for some sparkling varieties, but with regular hard cider you want to leave it at room temperature for about an hour before serving to warm up slightly, releasing its bouquet. • Of course, on a warm spring or summer day, you may want the refreshment of a chilled cider… and that’s just fine too. What foods generally pair well with cider? • It’s just our luck of the Irish that cider is perfect for St. Patrick’s Day favourites including Irish stew, shepherd’s pie, and other pub favourites like fish and chips. Think about your favourite foods with beer, and substitute cider. You’re looking for flavours in the dish that marry well with fermented apples, so grilled pork chops, where you might have apple sauce work well. • Also look for dishes that you might braise or tenderize with beer or cider as great matches such as game meats. • And of course, you can never go wrong with cheese! Many cheeses pair well with cider from hard cheese like cheddar for the robust flavour match to creamy soft cheese like brie because the fizz and natural acidity of the cider cuts through the richness of the cheese. Cider is great on its own but you say it also works really well as an ingredient in things like sangria? • Absolutely! This is a Rosé sangria made with Brickworks Rosé cider mixed with elderflower liqueur. There’s some honey syrup in there which is just honey mixed with hot water until it dissolves. There’s lemon juice and some fruit like strawberries, blueberries, and raspberries. It also works well in tons of cocktails like this mule. • This cider mule is delicious! It’s made with the classic mule ingredients – vodka, ginger beer and lime – but we’ve added some Magners pear cider and mint into the mix to give it a fresh pop of taste. See recipe further below, plus more cider cocktails. Every fall, I drive into the country to stop at a roadside stand to taste the sweet, amber juice of fresh cider. Along with cable-knit sweaters and hearty stews, the taste of sweet cider is a fall comfort not to be missed. Although most roadside stands sell non-alcoholic sweet cider, provincial liquor stores also sell fermented cider, known as hard cider. In fact, the recent resurgence in popularity of hard cider parallels that of microbeers, single malt scotches, single distilled cognacs and other artisanal drinks. Hard and sweet ciders have been made for hundreds of years. Invading Roman soldiers found natives in Kent, England, fermenting crabapple juice in 55 BC. After the collapse of the Roman Empire, cider making, like many other arts, declined and was practised mostly in monasteries. In AD 800, the emperor Charlemagne planted orchards in northern France, and Normandy, in particular, soon became renowned for its cider. When the Normans invaded England in 1066, they brought their taste for the drink, and eventually it became known as the “wine of England.” Today, both Devon and Somerset are known for their ciders. In North America, cider was more popular than beer among colonials, given it was twice the strength of beer but half the price to make. More than forty apple varieties, with such delightful names as Red Streak, Foxwhelp, Peasgood Nonsuch, Nobbed Russet, Sheep’s Nose and Lady’s Finger of Lancaster, are used to make cider in England. In Canada, the most popular varieties are Granny Smith and McIntosh. The best eating apples, such as Red Delicious, are too sweet for cider and don’t have enough acidity to balance their sweetness. Generally, many apple varieties are blended, each for the character it contributes to the final taste, whether it is tart acidity, sweet fruit, structural tannins or spicy and floral notes. Once harvested and washed, the apples are crushed into a uniform pulp called pomace. This is pressed to extract the juice, which is then strained through cheesecloth into jugs for sweet cider. For hard cider, the juice is fermented to about seven percent alcohol in either oak barrels or stainless-steel tanks for four to six months. Lyne Down ciders, which are made to an average of eight percent alcohol, are named not only for the small British hamlet in which they are made, but also for the folk wisdom that they should be consumed lying down. Many ciders are unpasteurized and unfiltered and are therefore cloudy when bottled. Cider aficiondos believe that this preserves the drink’s rustic, complex flavours. Commercial sweet ciders are often pasteurized through a flash heating process that kills bacteria, making the cider less prone to contamination. There have been Escherichia coli (E. coli) bacteria outbreaks attributed to sweet cider; however, these cases are increasingly rare as manufacturers are more aware of the causes of contamination and both large commercial and small farmhouse operations are using pasteurization. Check the label to see if the cider is pasteurized. If it is not, buy the cider only from a reputable, quality producer. If the alcohol content is higher than two percent in hard cider, this risk is eliminated as the bacteria is destroyed whether or not the drink has been pasteurized. There are several kinds of hard ciders, including draft cider, the most common commercial variety, which is about six percent alcohol, lightly carbonated and sold in six packs. Sparkling cider is made using the same method that is used for champagne; it is only six or seven percent alcohol. Stored in the refrigerator at 4°C (40°F), sweet cider will keep for one week. Before serving, leave it at room temperature for about an hour to warm up slightly, releasing its bouquet. You can also freeze it for ten to twelve months. Be sure to pour off one inch from the container to allow space for expansion during freezing. Thaw it in the refrigerator. Hard cider, however, will keep for a year without refrigeration, and once opened, for a few days in the fridge. Draft cider, like other kegged drinks such as beer, is best consumed within a few months. Fall favourites such as shepherd’s pie, lamb, game birds, deer and various cheeses pair nicely with rustic flavours of fermented apples. Many game meats can be tenderized by marinating or braising them with hard cider. Sweet or hard cider is also a vibrant ingredient in many dishes and sauces. Mulled sweet cider is sure to warm you and hard cider is a light, fragrant alternative to wine and beer. When you feel a chill in the air, reach for a glass of autumn ambrosia. Go green with our St. Patrick’s Day inspired sangria. Slainte! Cut up lime and apple into slices. Pour Pommies and wine into jug. Add fruit and mint leaves. Add lime slice on rim of glass for garnish. Summer in a glass. Roll into the weekend with this delicious summer cocktail. Thanks to our friends at Borrel Toronto for their take on a Kentucky Cocktail. Head to the Danforth for one or try this at home! Pour Pommies Cranberry Cider can (473ml) into glass. Add candied cranberries, rosemary, cinnamon stick and apple garnish. 2. To make the cocktail, fill a pilsner glass with ice. Pour gin and cider on top and drizzle the hibiscus simple syrup on top of the cider. Garnish with a dried hibiscus flower and serve immediately. Coat the inside of a hi ball with bitters then discard, add ice, followed by gin, schnapps and top up with, cider. Serve with a twist of lemon, great summer drink. Place liquids and maple syrup in a cocktail shaker. Stir briefly until maple syrup is dissolved. Add ice. Shake to chill. Strain into chilled cocktail glass. Garnish with apple slice and cinnamon stick. 1. Crush the slices of lime along with the maple syrup and the mint leaves. 3. Add the white rum and top it all off with sparkling ice cider. 4. Mix with a spoon and serve. 2 l. sweet cider, 70 cl. orange juice, 1 ladleful lemon juice, 1 pound oranges cut into slices, 1 pound bananas, 2 lemons cut into slices, vanilla sugar to taste. Mix in a large glass bowl the sweet cider, the orange juice, the lemon juice and the vanilla sugar. Add the slices of orange, banana and lemon. Put in the refrigerator and serve chilled. Mix all of the ingredients, except the apple and ice, in a cocktail shaker. Pour into two highball glasses, add ice and garnish each with a slice of apple. Pour the rum into an ice-filled highball glass first, then the hard cider followed by the Grand Marnier. Shake the vodka, cider and ice in a cocktail shaker. Pour into a martini glass using a strainer. Garnish with a slice of red or green apple. Combine the tangerine juice and cider in a pitcher. Pour into four glasses. and is after the great cider-making region, Normandy. The combination of sweet cider and Calvados, an apple brandy, finished with a thickened crème fraîche, makes this a spectacular dish. In a skillet over medium heat, sauté mushrooms in 2 tbsp (25 mL) butter for about 5 minutes; set aside. Trim fat from chicken. In a large, heavy skillet or Dutch oven, heat 1/3 cup (75 mL) butter and sauté chicken breasts and shallots over medium heat until the chicken is golden brown, about 4 minutes. Season with salt and pepper to taste. Warm the Calvados in a small saucepan. Using a long kitchen match, ignite the Calvados and pour it over the chicken and shallots. Allow the flame to die, then add the cider and sautéed mushrooms. Reduce heat to low and cook, covered, for 30 minutes, until the chicken is tender. With a slotted spoon, transfer the chicken to a heated platter and tent with foil. Increase heat under the skillet to high and cook to reduce the liquid by half, about 5 minutes. Reduce heat to low and whisk in crème fraîche, being careful not to let the sauce boil. Spoon the sauce over the chicken, garnish with parsley and serve immediately.